In the beginning of this letter, Peter recognizes that his death is fast approaching, “as our Lord Jesus Christ made clear to me” (2 Peter 1:14). His purpose in writing this letter, therefore, is to remind his hearers of those things which he taught them, especially in the face of false teachers. God has called us to “his own glory and excellence” in Jesus Christ (2 Peter 1:3). Therefore, the godly strive after virtue, knowledge, self-control, steadfastness, godliness, brotherly affection, and love–all fruits of the Spirit–because such things increase our knowledge of the Lord. Such fruits “confirm your calling and election” (2 Peter 1:10), because the fruits of the tree are evidence of its nature. To strive after good works is by no means to seek self-justification, but to earnestly desire the higher gifts (1 Corinthians 12:31). But to increase in the knowledge of the Lord is to listen to His voice (Luke 6:46; John 10:27). And if to hear those whom God has sent is to hear Him (Luke 10:16), how do we know whom God has sent? Peter therefore establishes his unique authority to speak on behalf of God, especially against those who claimed to have a superior knowledge. 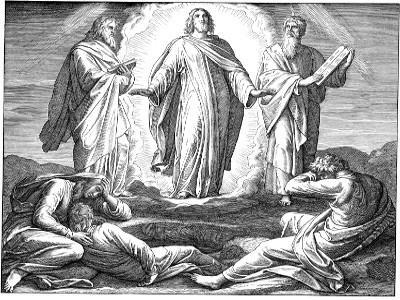 Peter was not “following cleverly devised myths,” but was himself an eyewitness of the Lord’s majesty on the mountain of His transfiguration (2 Peter 1:16-18). These false teachers could only claim some kind of secret knowledge which was no knowledge at all. Peter saw the truth of these things with his own eyes. However, what about those of us who are separated from Peter? He is an eyewitness of these things, but we live many generations later in the course of time. Peter has a unique authority, having seen these things for himself, but his authority is not based on his own person. The events which he saw are not true because he saw them. 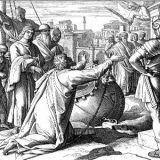 The events which he saw are true because it is the Lord who does them, and Peter testifies by his own experience that the Lord acted in a specific point in history. It would be true even if Peter never saw it, but Peter is in the unique position to say that it did happen before his very eyes. This the false teachers could not say, and therefore they twist the Scriptures to their own destruction, including the letters of Paul (2 Peter 3:15-16), by making them say something which God never said. Peter points to the Word as proof. God acting confirms the prophetic Word, because it shows that God cannot lie. “No prophecy was ever produced by the will of man,” because it is not men speaking which makes the Word what it is. Rather, “men spoke from God as they were carried along by the Holy Spirit” (2 Peter 1:21), what is typically called inspiration. The false teachers based their authority upon themselves, claiming in arrogance to know more than what the Word revealed. Peter, on the other hand, stood on the Word which had not been broken and was fulfilled before his very eyes. It is not Peter’s word, but God’s. I think it is worth noting that Peter does not define the means of inspiration, as if God was limited to a certain method in His dealings with men. Abraham saw a vision, so that his inspiration was primarily visual in some way (Genesis 15:1). Moses spoke with God face to face, as a man speaks with his friend (Exodus 33:11). The hand of the Lord came upon Elisha when the musician played at his command (2 Kings 3:15). Many of the prophets, such as Ezekiel, felt the hand of the Lord strongly, so that they saw spectacular visions (Ezekiel 1). 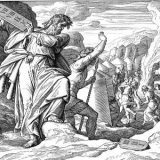 Daniel received inspiration from reading the book of the prophet Jeremiah (Daniel 9:2). It seems that some of the prophets received physical marks upon their bodies while inspired of God (Zechariah 13:4-6). Joseph heard the Word in a dream (Matthew 1:18-25). The Apostles spoke of what they had seen and heard (Acts 4:20). Luke followed all the things of Christ and wrote an account based on what he had heard from others (Luke 1:1-4). Even Caiaphas, hardened and unbelieving, as high priest prophesied concerning Christ, so that he did not know what he said (John 11:51). But however God spoke to men, it was the Lord speaking, so that “at many times and in many ways, God spoke to our fathers by the prophets, but in these last days he has spoken to us by His Son” (Hebrews 1:1-2).